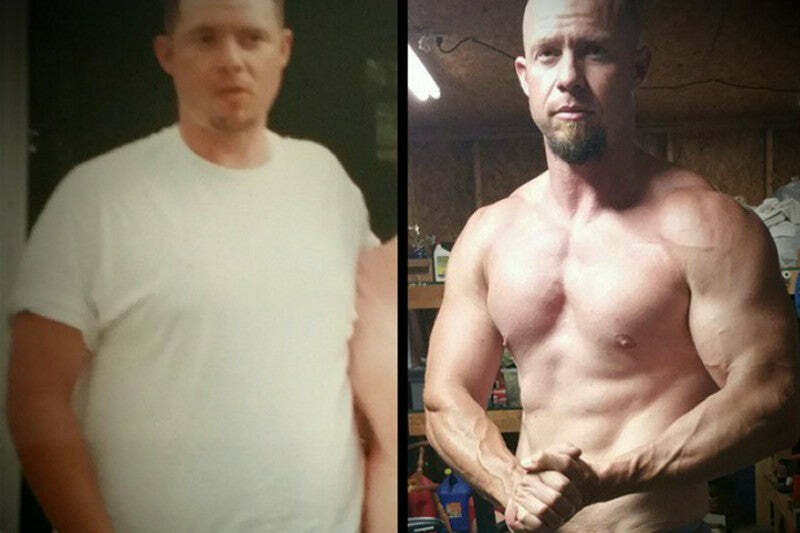 Transformation: Mark Sparks Drops the Belly and 55 Pounds! Growing up I wasn't much of an athlete but I always had an interest in lifting weights. I would workout with my dad in the garage with some old equipment that he picked up somewhere. Neither one of us knew much but we lifted on and off for years. We didn't have a clue about nutrition so we never really saw visible results. Eventually, I just quit. After not working out for years, and at this point I was about 20 years old, I wanted to be "skinny." I believe I was around 230 at the time. So I started at a gym and started eating chicken and rice. That's all I knew. It was extreme and I lost weight. In the meantime, I had quit the gym again but still lost weight because of the extreme diet. I met my wife around this time and stopped everything completely and began gaining weight again. At my heaviest, I was around 240 when she was pregnant with our second child. Eventually, I found p90x. I was able to get my weight all the way down to 155. However, once the program was done, so was I. I couldn't stick with it. I did this for years! I've done p90x at least 5 times over the years but I was never able to maintain it. Finally, in January 2014, I was introduced to the Tiger Fitness Youtube channel. I started going to the gym again. I watched every single video from Marc Lobliner that I could. I also started watching Dana Linn and Mike Rashid but I tried not to miss a single Tiger Fitness video. Since then I have completely changed my lifestyle. I am studying to be a personal trainer and I have inspired my son to start training as well to become a better baseball player. He goes to the gym with me whenever possible, and we absolutely love what we do. He and I are both making gains and I contribute a lot of it to Marc but I also know it has a lot to do with our desire to be different. To be the best we can be. At first, I followed the workout in the Fat Loss Factor book. I do experiment with different routines here and there but for the most part, I just follow a bro split and try to continually progressive overload per Marc and Steve's advice. For cardio, stairmill, walking, jogging and an occasional p90x routine to spice it up. I followed the diet and workout laid out in Marc's Fat Loss Factor book mainly. I deviate some from it to experiment with how nutrients affect my body. I use MTS protein, Machine Fuel, Ethitech Creatine, fish oil. Sometimes I replace a meal or two with sludge when I'm dieting. To be able to find something I enjoy doing and be able to adhere to it for so long. Seeing my son become interested in weight training is the best. I am also studying to become a personal trainer to help others change their lives. Lack of knowledge of nutrition and training. Going in too extreme and not making gradual changes to adhere to the lifestyle. Find something you enjoy and you'll be more likely to stick with it. Lead by example and don't try to force the lifestyle onto anyone. People are always looking for a shortcut, they always ask how you did it. And when you tell them the excuses start to flow like Niagara Falls. You have to have a desire to change and a want. If you don't it will not happen. I think the most important thing is to find something you enjoy and that challenges you. Be a leader. Lead by example and eventually, they will follow. The "they" I'm referring to in my case is the ones that matter most to me and that's my family. Teach them a healthy lifestyle by walking the walk and not just talking the talk. Eventually, they will see the what it does for you and hopefully they will want to be part of it. For me, my son has become completely dedicated and it is the most gratifying feeling. Eventually, as my daughter progresses through middle school she will follow as well. Both of my kids are athletes. I want to thank Marc Lobliner for what he does. He may or may not realize how many lives he has changed but mine is one and I am grateful for people like him. I follow Steve Shaw and Marc and both provide a great deal of inspiration for me. Thank You. I understand I am no competitor but I have completely changed myself. I'm just an average Joe, a working man who tries to find at least an hour or so a day to be healthy and fit. Previous article Transformation: "Weak" AJ Gonzalez Loses 47 Pounds!